Meeting the challenge of K3 Option 48 Reshebnik on theoretical mechanics manuals SM Targ 1983. 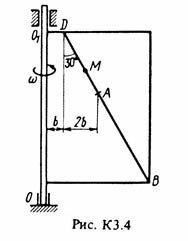 After payment you will receive a link to a zip archive with the solution of K3 option 48 on the theoretical mechanics of Reshebnik Manuals Targ SM 1983 for part-time students. The task performed by the methodical instructions and control tasks for part-time students of thermal power, mining, metallurgy, electro-instrument-making, automation and technological specialties universities.